Time flies when you're taking another stab at an apparently timeless franchise. Can it really have been 25 TV seasons since CBS premiered its version of Beauty and the Beast and 21 years since the release of Disney's animated, Oscar-nominated musical version? ABC ordered a Beauty and the Beast pilot for this season, but passed on what it called a "fantastical re-imagining of the classic fairy tale set in a mythical, dangerous world wherein a beautiful and tough princess discovers an unlikely connection with a mysterious beast." Given the long-winded description, it was probably just as well. But The CW, already home to Supernatural, The Vampire Diaries and two action hero hours (Nikita and the new Arrow), is plunging ahead with its version of Beauty and the Beast. Absent a singing teapot, it's instead a semi-facsimile of the CBS series, which starred Ron Perlman (now growling on FX's Sons of Anarchy) as the "Tunnel World"-dwelling Vincent the Beast and Linda Hamilton as assistant D.A. Catherine Chandler. 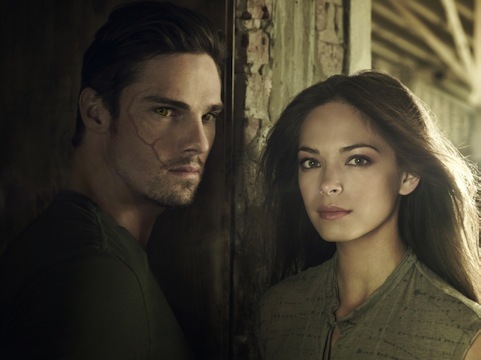 CW uses the same names, although Vincent (Jay Ryan) now has a surname (Keller) and Catherine (Kristin Kreuk) is a detective better known as "Cat." New York City is still their dangerous playground, but the new Vincent lives in an abandoned warehouse with his protective childhood friend, J.T. Forbes (Austin Basis). The old Beast nursed Catherine back to health after she was attacked and left to die in Central Park. New Beast can't save Cat's mother from armed attackers but does prevent them from killing her. Years then pass, with Cat transforming from bartender to detective while still wondering who saved her on that fateful night. Kreuk is accustomed to the company of otherworldly super-powered hunks after a long run as Lana Lang on CW's Smallville. The Beast likewise is a well-muscled, good-looking dude, albeit with a jagged scar bisecting the right side of his face. It's the product of a 2002 tour in Afghanistan after his brother died on 9/11. But sinister military forces of some sort transformed Vincent and others into something they weren't -- monstrous killing machines in need of eradication. "They couldn't stop us, we couldn't stop us," he explains. So it seemed like a good idea to go undercover after being presumed dead. Things get even loopier during a companion search for the killer of a newly promoted fashion magazine editor. Vincent just happened to be on the scene, and left his "cross-species DNA" behind. Cat and her partner, detective Tess Vargas (Nina Lisandrello), are assigned to the case. But the latter is left in the dark while Cat eventually tracks Vincent to his lair and then gets stuck with the line, "We're not done here." The Beast keeps trying to warn Cat off and even Hulks out in hopes of scaring her off. But he's unable to stop saving her, even though Cat proves to be Nikita-esque in initially beating the hell out of two subway thugs. Caught somewhere in the middle is medical examiner Evan Marks (Max Brown). He's a jaunty Brit with eyes for Cat after her previous boyfriend cheated on her and prompted Tess to declare, "You have a blind spot for douches." Well, the Beast is no douche, although he can be high maintenance. So off we go toward more weekly bouts with forbidden love and unsolved crimes. Beauty and the Beast won't hurt all that much to watch, but the dialogue and plot stretches can add up to a lot of little ows. That's pretty much standard operating procedure on the terminally struggling CW, which someday will probably just go away.